Alexandra Kosteniuk played another superb game today to clinch the final match and crown herself as the 14th Women’s World Champion. Seven years after losing a final to Zhu Chen, Kosteniuk was ready for the Chinese challenge and outplayed 14-years old GM-elect Hou Yifan by 2.5-1.5. The last game opened as Sheveningen Sicilian and Yifan threw everything forward in an attempt to equalize the score and reach the rapid tiebreaks. White, however, never appeared to be in trouble as Kosteniuk skillfully handled complicated variations. The final position is completely winning for White, but the new champion took a needed draw by perpetual check while it was there. Kudos to Alexandra as she broke through all the stages of a difficult and stressing knockout system to become the Champion. She was confident and aggressive and she never appeared to be struggling in weaker position. 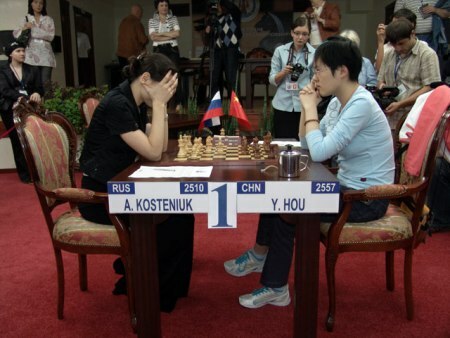 She even dropped a couple of winning positions, notably against Tatiana Kosintseva and 2nd game against Hou Yifan. Her coach GM Yuri Razuvaev said that Alexandra played convincingly and completely deserved to win the Championship. In the aftermath press conference, Kosteniuk dedicated this victory to her daughter and husband. “I played this Championship, but my daughter hasn’t seen her mother for almost a month and a half. I am hoping to catch up soon.” – she added.